Full Speed Ahead — Tree House Brewing Co. This Saturday at Tree House was our busiest yet. It was great to see many old friends and to make many new ones alike. We’re still shy about our hours but being shy cannot stop the word of mouth train and we continue to be humbled by the ever increasing patronage at the Tree House barn on St Clair Road. The crew came together strongly on this day to ensure a fluid experience for everyone. I’m happy to report that the day came off without a hitch. 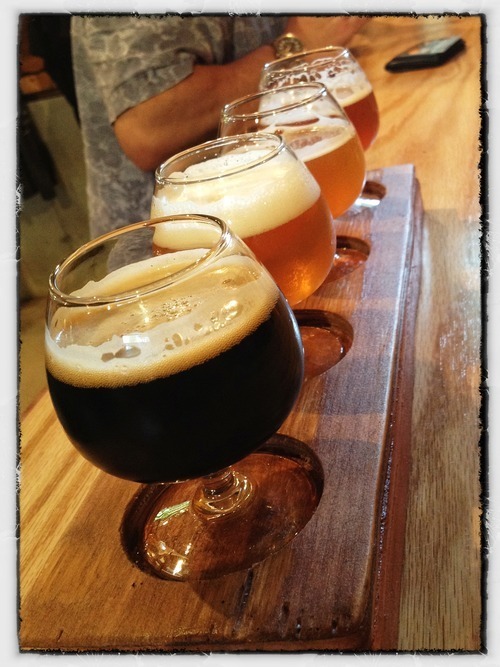 Damien started early by creating a Tasting Flight tray from scrap wood he had laying around his shop (pictured above). It could not have been more opportune timing. That thing saw more of a workout than Johnny has had in two years. Dean had his game face on and entertained a steady stream of friends and customers throughout the day; filling growlers, telling stories, and just being Dean. And we love him for that. Jonathan created new Gift Certificates, entertained customers, and wore a pair of sunglasses that would make Elton John blush. Nick, our intern, made steady progress with our yeast management program. All of this madness and we still managed to brew twenty fresh gallons of Nate’s Citra & keg another twenty gallons of a new beer, “Spawn”. There’s a Latin phrase “Amor Fati” (UH-more FAH-tee). It means “Love of one’s fate”. I come back to it a lot in my personal life. When we gathered in the barn a year and a half ago to start brewing beer together it was clear that Tree House was in our future. We’ve come a long way since then, and it all feels like fate. I don’t think I speak for myself when I say that we’re loving every minute of it.